I have been teaching a delightful client this week. Pilar is from Spain and is the Communications Director and Head of Corporate Social Responsibility (CSR) for an Italian Insurance company. She is on a one-week full immersion intensive Business course. Her level of English is lower Intermediate (B1). Before arriving, she had told me that she wanted to use this week to prepare for a presentation she has to give later in the month at a conference on CSR. So her goal was to practise how to present in English. On the first day she showed me her slides and the script of her presentation. It had been translated from the Spanish language and it was full of complex sentences and expressions that would have challenged a proficient user let alone an intermediate learner. Pilar’s plan was to read from the script to the audience and she wanted me to listen to her and correct her pronunciation along the way. Reading from a script will not allow us to engage with our audience and give them important eye contact as we are too busy looking at our script and not at the audience. When we read from a script we tend to speak in a monotone which means that our voice lacks intonation and life. This can soon turn the audience off. 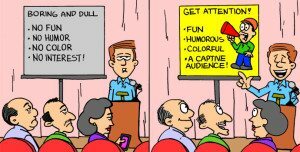 Only 20% of words are actually ‘heard’ in a presentation. The remaining 80% is all about the presenter’s voice and body language. So we need to work on this 80% and not the 20%. If we are presenting in a language that is not ours and we are reading from a complex text that is far more sophisticated than our actual level of the language, the audience will soon realise this knowledge gap. This could put us at a disadvantage, especially if we have to answer any questions from the audience. The expectation of such questions could also cause us a lot of unnecessary stress. Choose your words carefully. Think of the key words you want your audience to hear and remember. Above all, choose words and sentences that you know and are comfortable using in English. Don’t think in your native language. Your audience may understand the Business Jargon you use in your industry but could you explain that jargon in Plain English if you were asked a question? Speak slowly and pause as much as you need. Pausing is a great way of adding effect to your presentation but it also gives you that important thinking time before you say the next sentence. If you are unsure about your pronunciation, this pause will help you breathe and say the word more clearly. 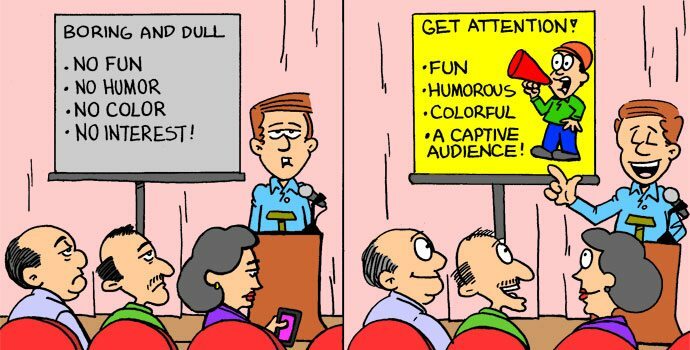 Smile and add some humour in your presentation. You don’t have to tell jokes, but smiling is easy and will make your audience follow you more. Remember, you are the presentation, not your words so use your voice, body language and personality to give that talk. If you want to have more tips on how to present in English, take a look at this YouTube clip of how Steve Jobs, the master of presentations, presented. 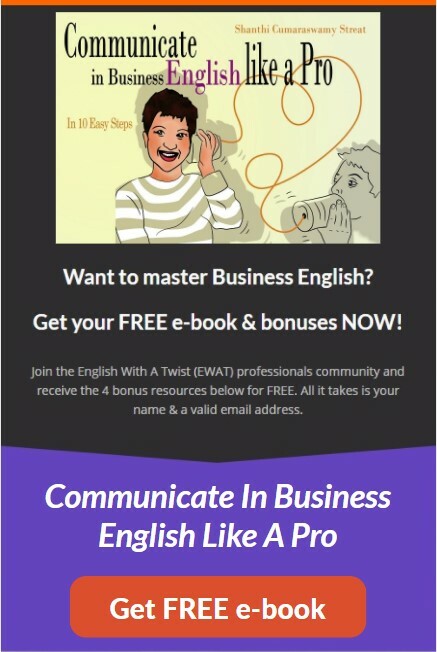 Do you have other tips you use on how to present in English? Please share them here. I hope you found this post useful. Please share it if you did. If you’d like to receive my posts directly to your Inbox, why not subscribe to my blog? I agree that these are great tips, however I am not sure they are exclusively for English. Presenting in Spanish is very similar. It has to do more with the culture and situation, than the language don’t you think? You’re absolutely right, Carissa. These tips can apply to anyone presenting in a foreign language. I don’t think it has to do with culture and the situation, though. The main point I was trying to make here is that presenters should pitch their language at their linguistic level of the target language and not try to translate from their native language. This advice would transcend all cultures. What do you think?